Monday night was cold with a sharp frost but the early winter sunshine made my drive to Enville through the beautiful Staffordshire countryside a delight. We were fortunate to drop lucky with a dry day and with no brollies needed and the occasional pair of sunglasses in evidence, winter golf was good. I’m getting much better at lighting the wood burner in the clubhouse; this year no one was aware that I had done it - not even the lads at Stourbridge Fire Station! The green staff were very busy removing self set trees and brash, allowing the growth of the heather that is a classic feature of all true heathland courses. Carry the on the good work gentlemen! Late call-up Gary Pickford arrived on the first after his team mates had teed-off and he was most impressed to see they were all on the green of the 150 yard par 3. However, he wasn’t aware that they had all played 2. Armani Dave Clark, that slave to golfing fashion, picked up the award for chump-team captain of the day as they left their score card on the breakfast table and then got lost on the course TWICE. It was good to see the Knights and the Etchinghams making up a husband and wife team and coming in with a creditable 82 points. Andy Russell won hearest the pin on the par 3 17th. 3rd and 4th places were decided on the back-six between two teams of good friends from Minchinhampton Golf Club. Both teams had 88. Mike Williams came over to check my calculations, no less than three times, as he came to terms with being the losing skipper to Mil Petkovic. 1st and 2nd places were also decided on a the back six with identical scores of 89. 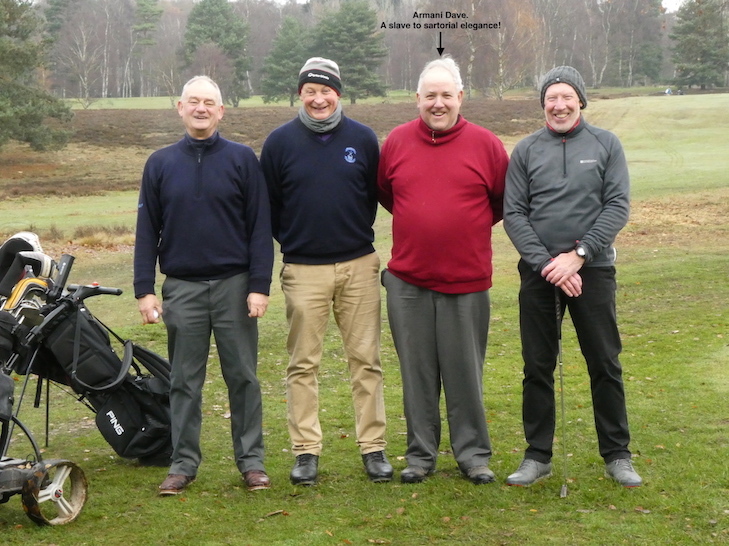 2nd went to an amalgamated team: Alan Holmes15 & Tony Davis14 paired up with Mark Rose15 & Paul Morgan 12. It wouldn’t surprise me to see them playing together again in the future. Despite losing their team captain Tim Worley, The Leisure Boys of Kim Hughes 12, Phil Beswick 8, John Showell 16 Ian Williams 12 narrowly managed top spot on the podium. Phil Beswick had already lost a shot following his win at Little Aston last Wednesday but despite this he became to first Teetours winner on two consecutive events. On a personal note, this week has been momentous for me. Exactly five years ago I was in the middle of combined, daily radio and chemotherapy, following thirteen and a half hours surgery to remove a stage four cancer tumour. On Monday my surgeon gave me the all clear and signed me off. I’m very sorry but it looks like you’re all going to have to put up with me for a bit longer. Kim Hughes 12, Phil Beswick 8, John Showell 16 Ian Williams 12. James Bishop +1; Dave Westwood 0; Richard Wileman 3; Graham Budd 22. Dave Sheppard 5; Sandy Johnson 6; Steve Pritchard 8; Mike Rooke 7. Angus Craig 11, Neil Walters 11, John Oldman 11, Terry Webb 9. Scott Antcliff; Ian Williams; Kim Hughes; Neil Aisworth; Steve Hawke; Peter Rulton; Andy Russell; Chris Crisp.